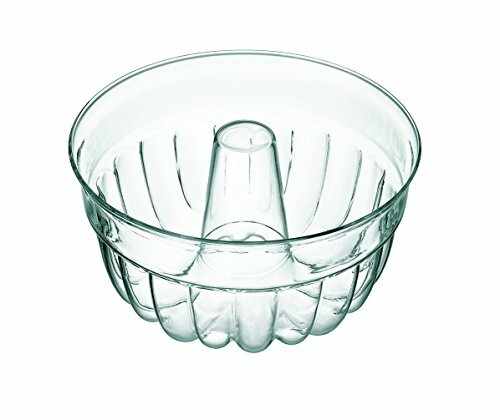 The handmade Simax 5031 borosilicate glass bundt pan is approved for use in professional food preparation environments. Simax glassware does not leech any chemicals into food and does not absorb odors or flavours. It is microwave, oven, freezer and dishwasher safe (although heat shock should be avoided). It contains no cadmium or lead and backed by a 10 year guarantee. This bundt pan is the smaller of two sizes produced by Simax. Borosilicate glass - Microwave, Oven, Freezer and Dishwasher safe. 1.3 Litre capacity. 8 inch diameter by 4 inches deep. Contains no cadmium or lead. Smaller of 2 sizes produced by Simax. If you have any questions about this product by Simax Glassware, contact us by completing and submitting the form below. If you are looking for a specif part number, please include it with your message.